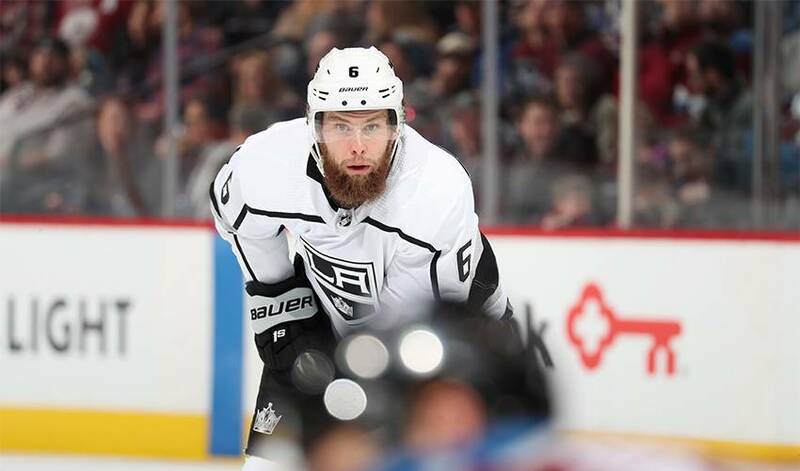 TORONTO — Growing up in southern Ontario, Jake Muzzin and his friends used to pretend they were their heroes from the Toronto Maple Leafs. Now that he's been traded to Toronto, the veteran defenceman gets to pull on a blue-and-white jersey with his own name on the back. "Everyone was a Leafs fan and I was included," said Muzzin of his childhood in Woodstock, Ont., approximately 140 kilometres west of Toronto. "Playing hockey at a young age, we looked up to Doug Gilmour, Wendel Clark. We were all Felix Potvin in net. It's kind of funny how life works. Here we are, I'm coming home to the team I routed for growing up." Muzzin was an integral part of the Kings' Stanley Cup championship team in 2014, but L.A. has struggled this season, sitting last in the Western Conference standings. He now joins one of the top teams in the East as it gears up for a deep post-season run. Maple Leafs general manager Kyle Dubas said negotiations began with Los Angeles GM Rob Blake in late December and that Muzzin checks a lot of boxes for Toronto, including having a year left on his contract before becoming an unrestricted free agent. He is owed US$4 million for the 2019-20 season. Note to readers: This is a corrected story. A previous version listed the incorrect year for the Kings' most recent Stanley Cup win.